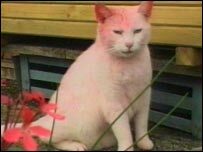 A west Devon couple are baffled by how their nine-year-old white cat turned pink after a weekend stroll. Brumas, who was named after the first polar bear to be born at London Zoo, went out for a walk on Friday near his home in Bratton Clovelly. 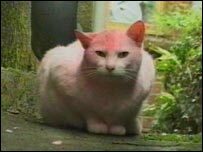 But when he returned later, his white fur had turned pink, astonishing owners Philip and Joan Worth. The couple took the cat to their vet in Launceston, Cornwall, who said he was in good health despite his new colour. Philip and Joan Worth said they were shocked when Brumas returned home. Mrs Worth said: "He was pink - Barbie pink. His head, ears and right down his body, although not underneath, had gone a quite brilliant pink. "We went to the vet on Saturday, but they couldn't find any reason for it, although they decided it wasn't toxic, which was what I was worried about." Mr Worth said: "We have thought about everything as to how this happened, from him being covered in some form of cow treatment to children's poster paints. "We have no clue where he was that could have caused this to happen." However, paint is not believed to be the cause as Brumas' fur was not matted. The couple, who adopted Brumas after he was found on Dartmoor and taken in by the Cats Protection League, have five other cats but none of them has been affected in the same way. Mrs Worth added: "He seems fine, he's eating well and the other cats aren't terribly bothered."